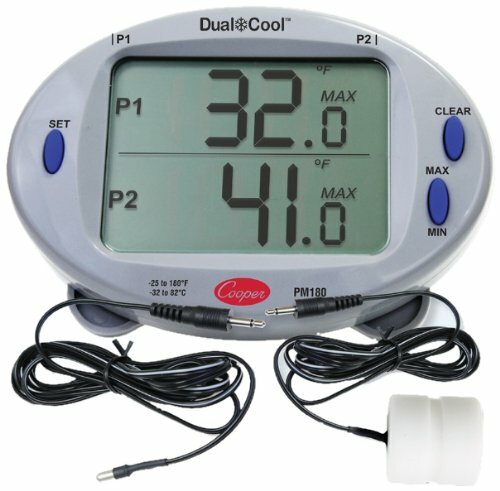 The Dual-Cool is Cooper-Atkins' first dual temperature panel thermometer with interchangeable probes, Min/Max alarm settings and Hi/Lo temperature recall. Equipped with user adjustable settings, it can simultaneously measure temperatures within two separate storage environments or two locations inside of the same reach-in, walk-in or hot-holding cabinet. Includes one Air Probe #2013 and one Solid Simulator Probe #2113 to monitor both ambient air and product temperature. Available in three different kits including either two air probes(PM180-02), two solid simulator probes(PM180-03) or one of each (PM180-01), allowing both the ambient air and product temperature to be monitored with a single unit. A high volume audible alarm and jumbo LCD makes temperature monitoring easier than ever.